Uganda, is known as Africa’s premier birding destination with the 7 Days Uganda Birding & Wildlife Tour promising you a birding heaven compiling a list of bird bird species found in Uganda topping a whooping 1061 in numbers. 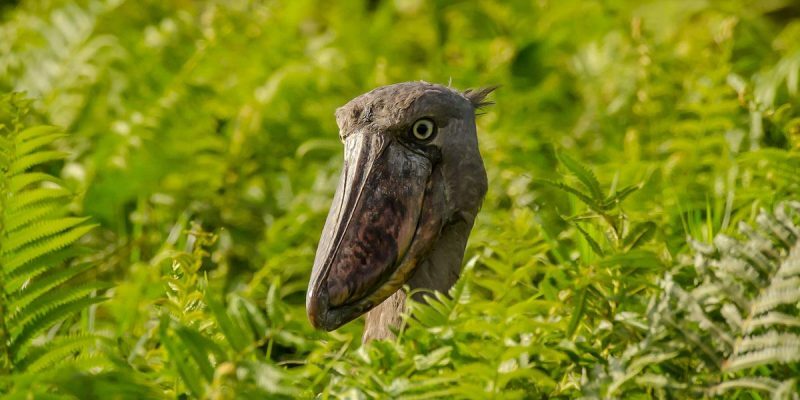 Many of these birds live only in these tropical forests with rare sightings being described as “mythical” while it is believed that some of the birds living in the remote forests of Uganda may not even be classified as of yet! Embark on the 7 Days Uganda Birding Tour and meet some the birds of Uganda in Entebbe surbabs, lake Mburo national park, Queen Elizabeth national park and Fort portal rain forests on this safari. Day 6: Bigodi Wetlands Birding. Our safari guide will pick you from your hotel and drive ou to Entebbe. Early search for birds from Garuga and other areas around Lake Victoria-Africa’s largest lake! On the search look out for birds such as the Blue Monarch, blue-breasted bee-eater, Brown Twin Spots, Fain tailed Widow bird, Moustached Warbler, White headed Barbets, Black headed Gonolek, Striped Kingfisher, African Pied hornbill, Red Chested sun bird, Diederik’s Cuckoo, Black Bishop, among others. Have lunch at Entebbe town and then connect to Uganda Wildlife Education centre, a home to captive animals. The educational-intergenerational centre has got over 250 species of birds which include the rare shoebill stork, parrots, ostriches, and seven species of weavers, such as the rare Northern Masked Weaver and Orange Weaver, among others. After breakfast drive to Mpanga Forest located 37 kilometers west from Kampala along the Masaka / Kampala Rd. The forest is endowed with prolific birdlife as well as impressive tree species. While on the trail expect seeing birds such as the blue breasted king fisher, African pied hornbill, spotted greenbul, black and white casqued hornbill, the great blue Turaco and the African grey parrot, Uganda woodland warblers, among others. Drive to Masaka branching off to Lake Nabugabo-a lagoon lake which was encircled off from Lake Victoria. The lake is endowed with a number of birds most especially water birds such as Herons, Lesser jacana and other water birds. Have lunch and proceed to Lake Mburo National park situated in south Uganda. Dinner and overnight at Rwonyo Camp/Mantana Luxury Tented camp. After breakfast, take an early morning game drive in Queen Elizabeth National Park-savannah Grassland Park dominated by acacia vegetation. Expect seeing a number of birds which include water birds, woodland and grassland birds, as well as wetland birds. After breakfast, go for an early morning game drive through the park. On the drive you will not only see the wild but also different bird specie found in the park. From the open grassy plains you may see different birds such as the Saddle billed stork, White and Abdims Stork, Brown Snake Eagle, Whalbergs Eagle, Bateleur, African harrier-hawk, Marsha Eagle and Grey Kestrel among others. Take on a morning game drive through the park. After lunch drive to Fortportal town-a beautiful town overlooking the legendary mountains of the moon. Visit the Crater lakes region and later transfer to your accommodation establishment for dinner and an overnight Ndali Lodge/Crater Valley Kibale. After breakfast drive to Bigodi swamp which is endowed with a great variety of birds.On the beautiful nature walk expect to see birds such as the Great Blue Turaco, Papyrus Canary, and White Winged Warblers. Proceed to the forest for a short walk where you will see different primates, tree species and forest birds. After lunch, visit the Crater Lakes region where you may see birds such as the White Spotted Fluff-tail, Scaly-throated Honey-guide, Blue Headed Coucals, Yellow Billed Barbet among others. Return to your Lodge/Hotel for dinner and overnight. After breakfast, depart leave the beautiful Fortportal town for Kampala. Have a stopover at Mubende for lunch and take a short visit to the Nakayima tree. Arrive in Kampala late afternoon.